Meet the anti-Israel demagogue who will likely be Egypt’s next president. 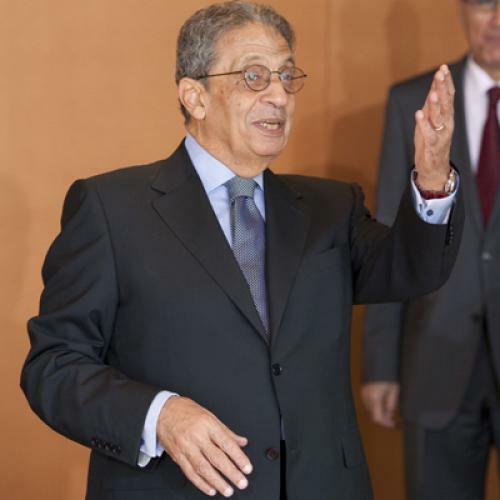 In 2001, Amr Moussa, the current Egyptian Secretary-General of the Arab League, briefly achieved pop-icon status. Serving at the time as Hosni Mubarak’s foreign minister, Moussa’s frequent anti-Israel pronouncements caught the attention of Egyptian pop singer Shaaban Abdel Rahim, who released a song with the line, “I hate Israel and I love Amr Moussa.” The song became a tremendous hit. Shortly thereafter, Mubarak, who had come to regard Moussa as a serious political rival, exiled him to the Arab League. Ten years later, however, Moussa is back in the public eye. Despite having represented the combined interests of the Arab world’s 22 autocracies for the last decade, he is now the frontrunner to succeed Mubarak in what could be Egypt’s first-ever truly democratic presidential election. And Moussa owes his startling political ascendance primarily to one thing: his shameless exploitation of anti-Israel demagoguery for political gain. Moussa was born in 1936 to a family from al-Bahada, a Nile Delta village in the governorate of Qalyubia. Shortly after graduating from Cairo University’s Faculty of Law in 1957, he entered Egypt’s foreign service. “He told us that he was the future foreign minister of Egypt,” says former Egyptian Ambassador to Portugal Wahid Fawzi, who got to know Moussa as his colleague during the early 1960s. Moussa was prophetic: After working in various diplomatic posts, including ambassador to India, director of the Department of International Organizations in the Ministry of Foreign Affairs, and permanent representative of Egypt to the United Nations, he was appointed foreign minister in 1991. As Egypt’s top diplomat, Moussa immediately projected an adversarial approach toward the United States and Israel. One of the first issues he handled was the Madrid Peace Conference, which the George H.W. Bush administration hoped would help shape a new regional order following the Persian Gulf War. When Israel insisted that the administration push for the repeal of a U.N. General Assembly Resolution that equated Zionism with racism as a precondition for joining the peace conference, Moussa demanded that the issue be tabled until after the conference, and Egypt was ultimately absent from the vote. Later, when Israel pursued improved ties with Arab states following the signing of the Oslo Accords in 1993, Moussa argued that full Arab normalization should occur only after the final exchange of territory. Then, prior to his first official trip to Israel in August 1994, Moussa gratuitously sparked outrage by indicating that he would refuse to visit the Yad Vashem Holocaust memorial. He eventually relented under intense diplomatic pressure but, even then, declined to enter the Hall of Remembrance, where he would have had to wear a yarmulke. Yet Moussa’s image-making moment came in 1995, when he spearheaded a pan-Arab initiative against re-signing the Nuclear Non-Proliferation Treaty (NPT)—unless Israel signed it first. The standoff riled Washington because Moussa, in pushing back against the treaty and undercutting more pragmatic members of the Mubarak regime, was acting counter to Egypt’s promise to the Clinton administration that it would not actively campaign against the renewal of the NPT. Although the treaty was ultimately renewed without Israel’s participation, Moussa’s stance made him a local hero, with the state-run daily al-Akhbar portraying him as a bare-chested Pharaoh. Moussa compensated for these formal limits on his power by intensifying his rhetoric against Israel. “It is almost impossible for members of Mubarak’s cabinet to adopt different positions from the one of Mubarak,” says former Egyptian Ambassador to Switzerland Nagi el-Ghatrifi. “But sometimes Moussa, in order to gain popularity—and he knows very well how to measure the nationalistic feelings of his audience—he’s taken by his enthusiasm and ambitions to attract the respect and admiration of the people, to go beyond the limits.” By 2001, however, Moussa had undercut Mubarak one too many times, and the pop song that paid tribute to him appeared in many ways to symbolize the final straw. In February, Mubarak figured he’d get rid of Moussa by nominating him to head the Arab League, which the other Arab states approved unanimously. Moussa’s appointment to the Arab League was intended to be a demotion, but the organization’s toothlessness ultimately gave him broader freedom to bolster his nationalist credentials. Though Moussa condemned the September 11 terrorist attacks, he immediately refused to participate in any anti-terror campaign that included Israel, which he accused of “slaughtering” Palestinians, and he later declared, “Launching strikes against any Arab country under any pretense would lead to severe complications.” In staking out these positions—along with his subsequent opposition to the Iraq war, the start of which he called “a sad day for all Arabs”—Moussa employed colorful, nationalist language while echoing the views that other Arab leaders broadly shared. But as an ascendant Iran started pushing a bloc of pro-Western Arab states toward the U.S. during the second half of the last decade, Moussa’s anti-Westernism became more pronounced. During the 2006 war between Israel and Hezbollah, when a number of Arab states quietly endorsed Israeli actions against the Iranian-backed terrorist group, Moussa immediately blasted Israel and later declared that Israeli forces were “targeting civilians.” Then, during the 2008-2009 Gaza war, Moussa lashed out at those Arab governments that backed Israel’s actions against Hamas, saying that intra-Arab divisions would mean “disregard of the Arabs” in international politics and arguing that “only our cohesion can save us.” He later tried to build this new Arab cohesion by, as usual, positioning Israel as the unqualified enemy, saying that any Arab country that pursued normalization with the Jewish state would face a “tough” reaction. Since Mubarak’s resignation on February 11, Moussa has held a sizable lead over other potential candidates. A poll commissioned in March by the New York-based International Peace Institute found that 37 percent of Egyptians preferred Moussa, while Field Marshall Hussein Tantawi, who currently leads the Supreme Military Council, was a distant second with 16 percent. Egyptians are even cooler on Moussa’s other potential rivals, mainly because they are seen as more pro-Western. For instance, many Egyptians believe—incorrectly—that former International Atomic Energy Agency chief Mohamed ElBaradei, who will likely run for president, supported the U.S. invasion of Iraq. Meanwhile, a very effective character assassination campaign has tarred Ghad party leader Ayman Nour as an American agent, while Nobel laureate Ahmed Zewail’s American citizenship is likely to dampen his support. Moussa’s popularity has remained strong even in recent weeks, when youth activists have increasingly attacked him for “not turning out strongly during the events in Gaza, Iraq, Yemen, Libya, and Syria." While it is tempting to believe that Moussa’s long diplomatic career would make for a relatively smooth post-Mubarak transition, the source of his popularity should be deeply concerning to the U.S. and its allies. Though war between Israel and Egypt seems highly unlikely, Moussa recently told a group of Egyptian youths that the Camp David Accords had “expired,” apparently backtracking from earlier statements in which he supported the maintenance of Egyptian-Israeli peace. He has also called for a “no-fly zone” over Gaza, thereby equating Israel with the Qaddafi regime. Moreover, Egypt under Moussa is likely to be less friendly towards U.S. interests: WikiLeaks documents suggest that Moussa does not view Iran as a threat and would seek to strengthen Arab-Iranian ties. The Obama administration got a taste of Moussa’s anti-Western populism as it tried to build international support for intervening in Libya. Although the Arab League initially voted to back the no-fly zone on March 12, Moussa lambasted the attacks on Qaddafi’s forces a week later, telling Egypt’s state-run Middle East News Agency, “What we want is the protection of civilians and not the shelling of more civilians.” And though Moussa issued yet another reversal two days later—this time restating the Arab League’s support for action against Qaddafi—his inelegant 360 should be a reminder that he has made his bones bucking the West. So while the fall of Mubarak raises hopes that Egypt will enjoy a post-authoritarian future, the prominence of Moussa threatens to revive Egypt’s anti-Western, Nasser-era past. And, most alarmingly, this is apparently what many Egyptians want. Eric Trager is a Ph.D. candidate at the University of Pennsylvania and an associate scholar at the Foreign Policy Research Institute. He recently returned from research in Egypt, where he was living during the revolution.